Free Digital Report. Available Now. 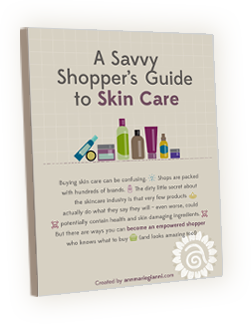 A Savvy Shopper's Guide to Skin Care is for you. Many skin care products aren’t what they say they are, so we’ve put together this easy-to-use, free report to help you make an informed decision when it comes to buying your beauty products. How to easily sniff out the 10 most common toxic ingredients found in your skin care products. How to know if your products actually have enough of the “magical” ingredients they’re boosting about. Why most soap is damaging to your skin and how to find one that isn’t. The one ingredient you don’t ever want to use on your skin every day. The one word on the label that covers up some of the most toxic ingredients. The six things that you can do when you’re at the store or shopping online. A Savvy Shopper's Guide to Skin Care Now. Yes, we’re a natural, organic skin care company, but we in no way believe that our products are the only good ones out there (even though we feel they are pretty amazing.) What you’ll find inside are tips that you can use to make your beauty routine more natural — no matter whose products you love.